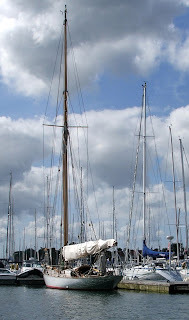 Opposite ends of the boating spectrum, an old gaff cutter lying alongside a modern racing yacht, well sometimes things are not quite what they seem. 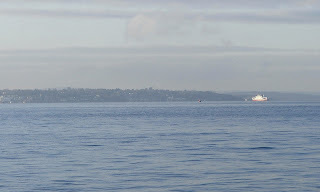 The red boat, belongs to my friend Mark and is an Oyster Lightwave which has been converted into a fast cruising boat. 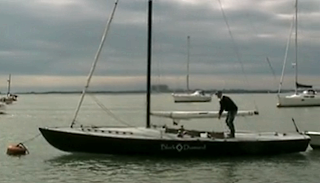 Mark worked with local yacht designer Stephen Jones to modify the rig and make it easily managed by a crew of two. Below Mark and partner Amanda have installed a practical and comfortable interior. They returned to the Hamble last summer after a year long cruise of the eastern Atlantic including the Canary Islands and the Azores. And that old gaffer, well gaffer certainly but perhaps not so old. I don't know the background but I recall the hull being finished in a local yard a couple of years ago. The give away though are those black carbon spars! 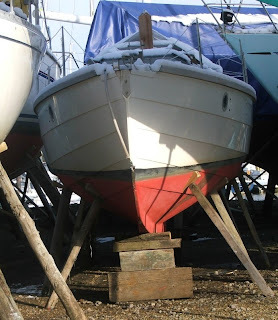 What with the snow and I admit some general lethargy, winter work on our yawl Greta hasn’t been progressing especially well, so I was determined to get some work done at the weekend. 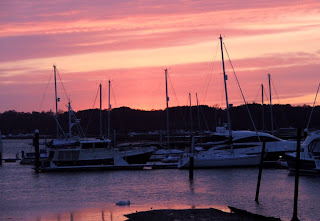 On my morning run, early Saturday I spotted a boat leaving its mooring in Bursledon. There was a perfect, if chilly northerly wind, as the small yacht rounded Lands End Hard they set the genoa to sail off down river. It was before 8 o’clock, the river was peaceful with only the curlews and oyster catchers breaking the silence - perfect winter sailing. 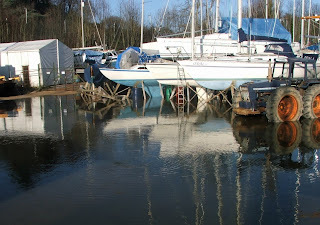 I resisted the temptation to take the dinghy out sailing and knuckled down to some work down at the boat yard. Within a couple of hours I had the rudder off, the prop shaft and cutlass bearing out and ready for a replacement, one of the bigger jobs I planned this winter. Sunday was busy, I started the day with a slight hangover, then I had to go to Portsmouth to pick up my daughter who had just got back from a ski trip. I think she must have had a bob sleigh in her luggage - it was huge! After that, and making lunch, I managed to get the hull polished and if I say so myself, looking pretty smart. Then it was back home in time to take Joe to the swings in the park. Anyway there was no wind, but the sun did come out for a while and very nice it was too. 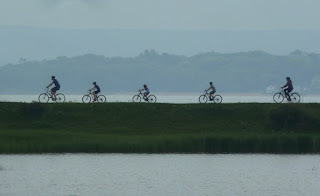 Hopefully with the snow and bad weather behind us, it won't be long until the nights draw out and summer is here again. So here's a reminder of the summer and some of the boats on the river during 2009. 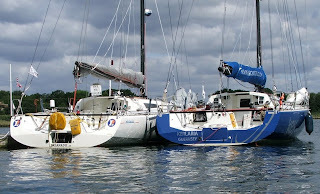 These rocket ships were assembled in July, I guess waiting for start of the Fastnet race. A few yards away is this wonderful gaff ketch, I think it’s a Fife, but the tide was running so I couldn’t get close enough for a good look. 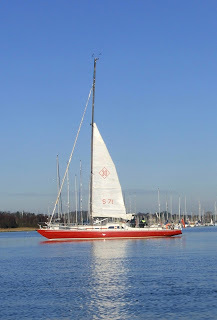 I’m guessing this latest Spirit Yacht was on the Hamble for the main season’s event – Cowes – beautiful. You can see why James Bond would want one. On a more modest scale there are several Folk Boats on the river, they are lovely, this Scandinavian version is preparing to slip the mooring. 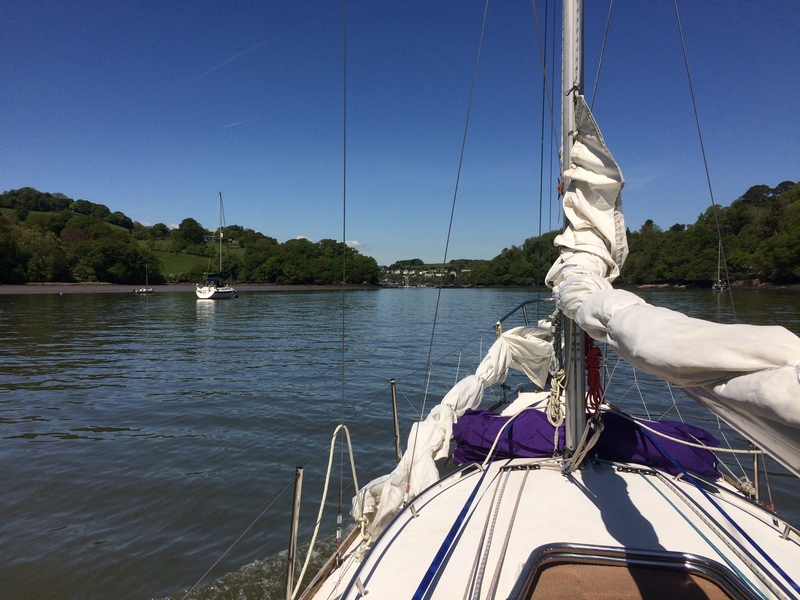 There’s a growing fleet of Memory’s on the river, built at Saltern’s Boatyard up by Hackett’s Marsh, they are a 19 foot gaff rigged sloop and very fast – well they keep beating me in the Old Gaffers event!! Not wanting to wish the year away, but roll on summer! And don’t even bother to ask about a candlestick maker. 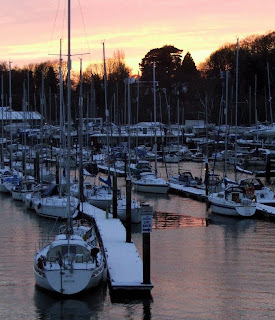 One of the petty annoyances for those living in Bursledon is the lack of local shops. Of course we do have a huge Tesco superstore, built on the site of the old Windhover Manor, which sells pretty much everything. They are open 24 hours most days, plus there’s a convenience store in Lowford for bread, milk and fish fingers etc - so what’s the problem? Well the problem is I like to shop for fresh, local food, at local shops, where I know people. Sadly the nearest local shops are at Park Gate, more than a couple of miles away, which means getting in the car and driving. But at least they have a butcher, a greengrocer and a bakery (which makes especially good sausage rolls!!). 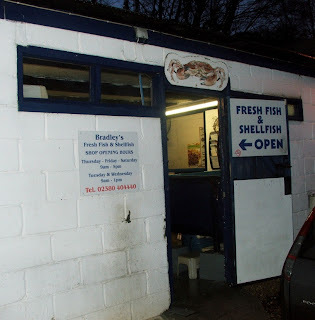 Having said all that, down beside Bursledon Bridge we do have Bradley’s fish mongers. 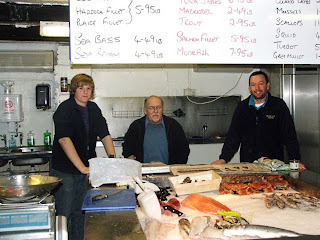 Tucked away behind the Cabin Boatyard, they have a great selection of fresh fish and shell fish. Erica and I dropped by just before closing time on Saturday to pick up some mussels for tea. Stuart, Alec and Tristan (from right to left) were getting ready to shut up shop, but there was still plenty to choose from and it was delicious!! I've been intrigued by the Yachting World Diamond ever since I saw Black Diamond on Dylan Winter's video diary "Keep Turning Left". 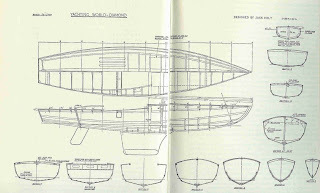 Back in 1960 the editors of yachting world sought ideas for the design of a new keel boat. The requirements were that it be reasonably priced, yet have high performance suitable for national and international racing. 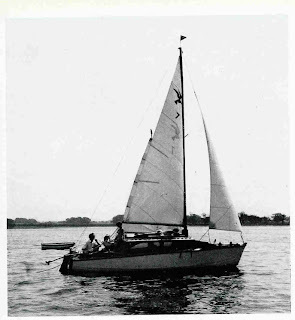 The details of how he became involved are not clear, but Jack Holt a dinghy designer more famous for his GP 14, Cadet, Enterprise and Mirror dinghy, used his small boat experience to create a revolutionary 9 meter plywood keel boat - which some describe as a dinghy with a keel. 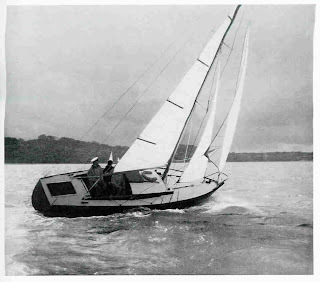 The Yachting World Keel Boat was first shown at the 1961 boat show to great interest, and one went on to win the 250 boat strong open class in a race around the Isle of Wight in that year. The boat was launched in Australia on Pittwater in 1962 and has a strong following right up to the present day under the Yachting World Diamond Association of Australia, the name being changed to Diamond in 1967. Since the 1980's the boats have also been made in fibreglass. 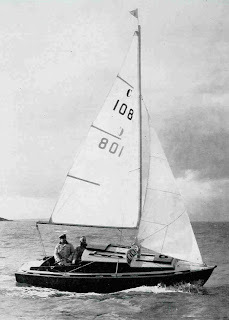 Plans are available for the Australian Association and the boat can be home built within the class rules. Although I don't especially want to build one, I was interested to understand the hull form and learn more about this fasinating boat. Imagine my surprise the other day, I was looking through my collection of old sailing books when I found these lines plans in a volume "Make Sail" by Peter Heaton. The snow has all gone and things are pretty much back to normal. Well, the wind is blowing in warm air from the southeast, which has cleared the snow that had brought the area to a standstill; and with it some rain, so it's a wet weekend. 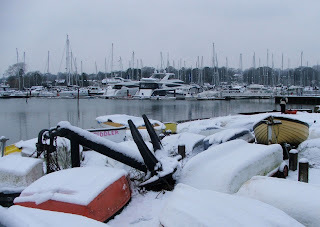 Before we forget the snow, here are a few pictures across the Solent from last week. The first is Ryde. 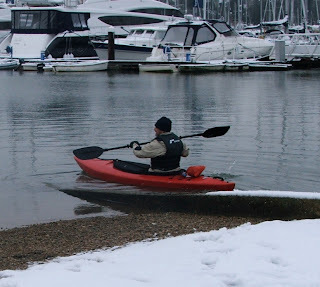 Even with the snow laying thick on the ground a few brave souls were out on the water . The middle downs looking more like an alpine scene, appropriately called "The Wight"
The piece by Tom over at 70.8% about the Bell Woodworking Seagull got me thinking about these post war plywood yachts. As Tom explains the Seagull was built by Bell Woodworking in Leicester. 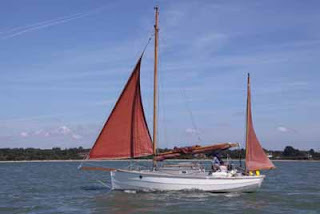 Boats were supplied complete or as kits, the Seagull at 3Tons T.M was 18'6", designed by Ian Proctor of Wayfarer fame. Also from the same stable was the Seamew, larger at 22'. Both were designed with the "four plank" hull which gave something between multi-chine and clinker built boat. 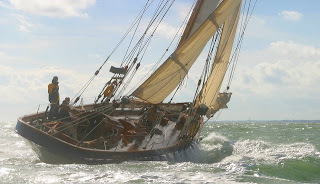 Each had an early lifting keel, which raised more or less vertically and had a bulb at the lower end, a seaworthy design which was able to explore shallow creeks and rivers. 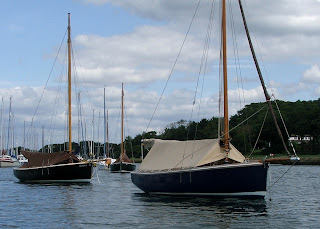 One of the better known yachts of the type and era was the Debutante, with the less well known sister ship the Escapade, both were designed by Robert Tucker and built by Blanks Boatyard in Hertfordshire. 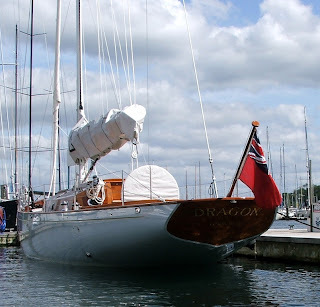 Although very similar in hull form the Debutante at 21' was a bilge keel sloop, whereas the larger Escapade at 25'9" sported a fin keel and double head sail cutter rig. In 1964 you could buy a Debutante for £650. I have never seen one, but this Robert Tucker designed Mystic looks like a very practical and sweet design. The raised coach roof is a good way to create interior volume on a small yacht and does so without the reverse sheer which was popular at the time, but which to some people can look unsightly. 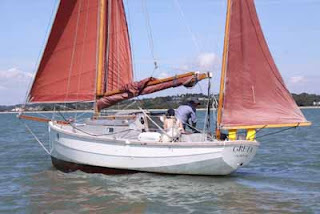 Also from Robert Tucker was the 18'6" Caprice, built by "Nobby" Clark of Cowes, one example "Shrimpy" was famously sailed around the world by Shane Acton. 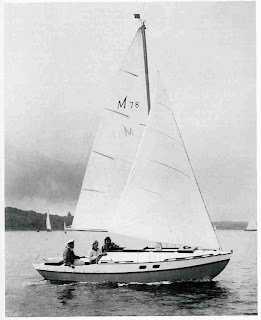 Although generally regarded as a bilge keel cruiser, the Caprice was offered in fin keel form as a JOG (Junior Offshore Group) racer with a larger sail plan. I admit to a fondness for the Caprice, which was the first yacht I owned. Although mine was a late model Mk V built in fiberglass, you still had to open the fore hatch in order to use the toilet. 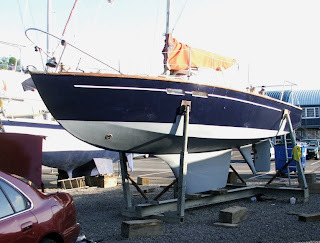 You can still find examples of these plywood classics, this is an Escapade getting a coat of antifoul before the summer season last year. This sloop has the look of an early Robert Tucker Caprice, but is sadly looking a little neglected. After the buffeting gales we had during October and November, and the recent snow, I thought it would be nice to remember that we do generally get calm and settled weather. 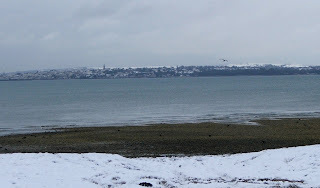 This is the view from Hillhead across to Cowes with the Red Funnel ferry making it's way across an almost flat Solent. Further east, off Wooten Creek this gas tanker was throwing up a bow wave, but other than that things were still pretty calm. 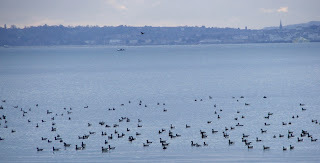 So calm that these Canada Geese were happy floating around off the shingle at Stokes Bay, in the background Ryde on the Isle of Wight. It's true we don't get snow very often, but as the weekend arrived it seems like we've had it for ages. 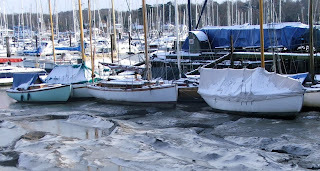 Down at the yard Greta had a good covering of snow, if you read my post last week, there is some small advantage to the boatyard flooding the salt water has kept all the snow from settling on the ground. Although not on the cabin top and decks. Even salt water wasn't enough to stop the mud freezing! With no prospect of getting any work done, we walked home and enjoyed the sunset. And what a sunset it was, truly a winter scene. Hard to believe then, that this picture of a local 30m class yacht was taken only a week ago while I was out rowing in glorious sunshine. 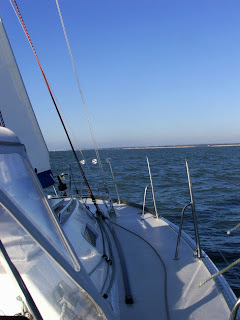 Or Sunday a week ago sailing with friends off Hill Head. We don't get snow often and when we do it normally disappears in a couple of hours, so I couldn't miss the opportunity to see what the river looks like. 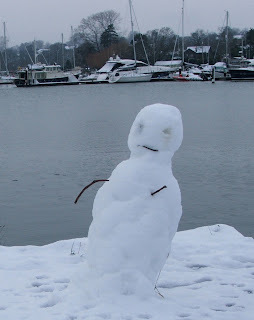 A snowman down on Swanwick hard is definitely a first, certainly as long as I've lived here. Mind you he does look a little bit drunk, must be all that sea air! 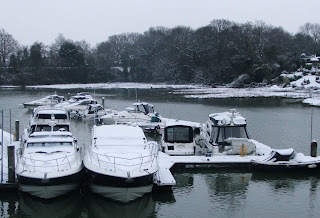 The dingy park looks quite nice, some of the more tired and tatty dinghies look much better with a think covering of snow. 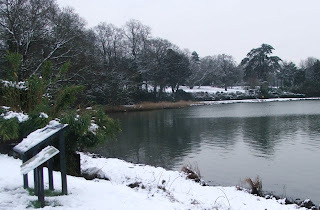 And yes, for those who noticed, that really was a canoe in the background, some people will go out in any weather. 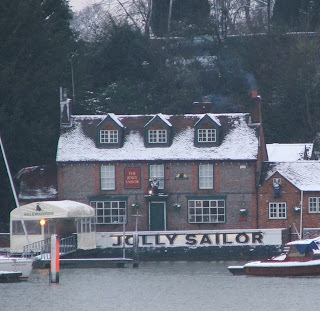 The Jolly Sailor looks really nice with a covering of winter snow, on occasion I've been known to fall over on my way home and that's without all the ice and snow! Right across the river everything is black and white and cold, looking like the heart of winter. 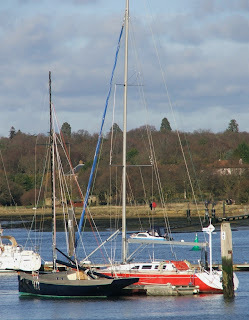 Back in April I wrote about local pilot cutter Annabel J and the unusual method of mast painting . I was delighted to get an email from skipper Phil Cogdell recently with more details and some super photos. 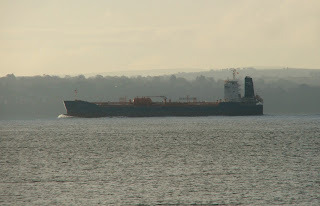 and sailed by the Bristol pilot Frank Trott. The designers of Annabel J, Duchy Boatyard Services, have managed to combine modern materials while retaining the traditional elements, ideas and character of the pilot cutters. At 54 feet in length on deck and 40 tons displacement Annabel J is one of the largest of her type, yet she is fast thanks to her large, powerful and well planned sail plan. She has left more than a few modern yachts in her wake. With her pilot cutter heritage, you would also feel confident and comfortable standing up to some bad weather. 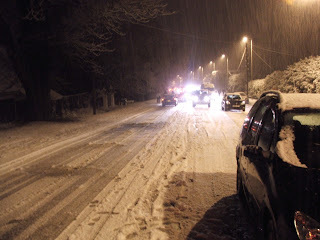 It doesn't snow here very often, so tonight's snow fall caught out more than a few commuters. 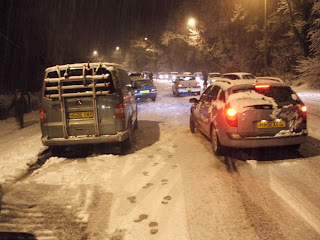 This is the main A27 going up from Swanwick to Sarisbury Green, the snow had fallen so fast and so quickly that cars were getting stuck trying to get up the hill. More than one driver made things worse by spinning their wheels in first gear. 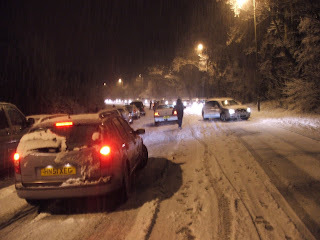 As people abandoned cars at the side of the road, divers trying to go up the middle got stuck. Those going downhill had an easier time, but got stuck the other side of the river going up Providence Hill. 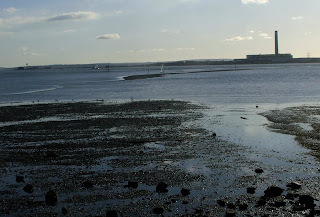 The Hamble river flows out into Southampton Water and the Solent beyond. 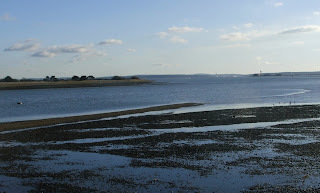 From Hamble Point the outgoing tide starts to reveal the long shingle spit. 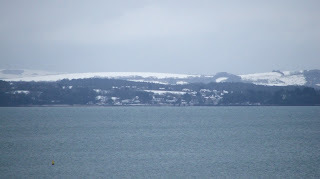 To the left of the picture is the east bank of the river, in the distance is Cowes on the Isle of Wight and on the right Calshott Castle and activity centre. Across Southampton water is the power station at Fawley, closer to the spit is staring to emerge, the slick water indicates some of the local currents and eddies. 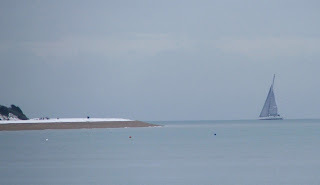 The channel is well marked by posts and lights, terminating at Hamble Point South cardinal buoy. 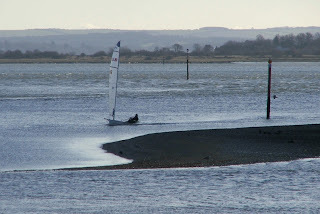 This hardy dinghy sailor was making good progress despite the storng outgoing tide. After my failed attempt to do some work at the boatyard yesterday, I rowed down the river and bumped into a friend Greg who has just bought this pretty little motorboat. 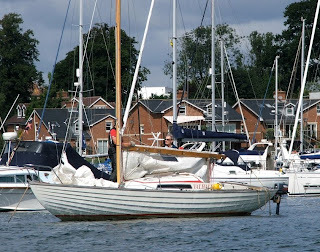 She was designed by Fred Parker of Warsash in the late 1960's or early 70's and the original boats were built locally on the river up at Botley. 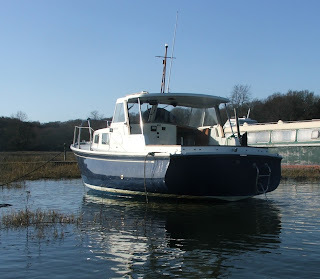 This one was built much later in the 90's and is a great example of a displacement motorboat, stable and seaworthy, she's ideal for the Solent. Greg tells me she slips along at 6.5 knots using less than a gallon an hour, so she will got to most places in about the same time as it takes to sail. Just the thing for a nipping over to Cowes, a spot of fishing or just taking it easy in Newton Creek. I have a thing about transom's and I think Mr Parker drew an especially nice one here, my advice to Greg, ditch the ladder and write her name in big, bold, gold letters. 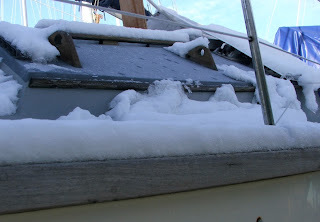 I really did start the day with the best of intentions, the clear skies overnight had left a white dusting of frost, but with some warm winter clothes on, it promised to be a nice day to get some work done on Greta, our yawl, while she is ashore in the yard. 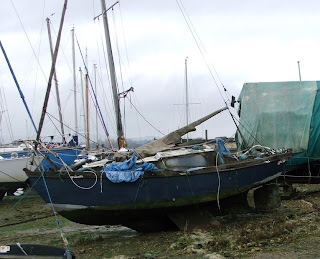 And of course, when your boat is ashore, why would you bother checking on tide times? A couple of nights before I was too busy drinking and not thinking, when we had gone out to admire the spectacular full moon. 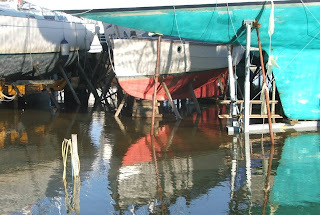 A big spring tide normally occurs a couple of days after full moon and so it was that the boat yard was completely flooded. Greta was blocked up so at least she was high and dry, but there was no way I was going to get out to her without a pair of waders. 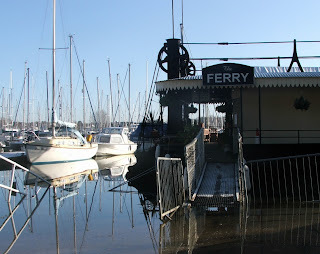 Even the entrance to the Ferry Restaurant was flooded, at that point I packed up my tools and went rowing.